Click the play button to see a prescribed burn in Wilson County. Dillan Howard, an assistant ranger in Wilson County with the North Carolina Forest Service, sets a precribed burn Friday to promote quality native growth that is beneficial to wildlife. Brandon Webb, Wilson County ranger for the North Carolina Forest Service, looks over a section of forest after a set fire has come through, eliminating unwanted underbrush. As Ranger Dillon Howard laid a strip of burning fuel through the forest, it was only seconds before the path where he had just walked was ablaze. Dry underbrush quickly ignited upon the introduction of fire under the canopy of a pine plantation off Bakertown Road east of Wilson. Friday’s fire is one of a handful of prescribed burns that will be undertaken this month. 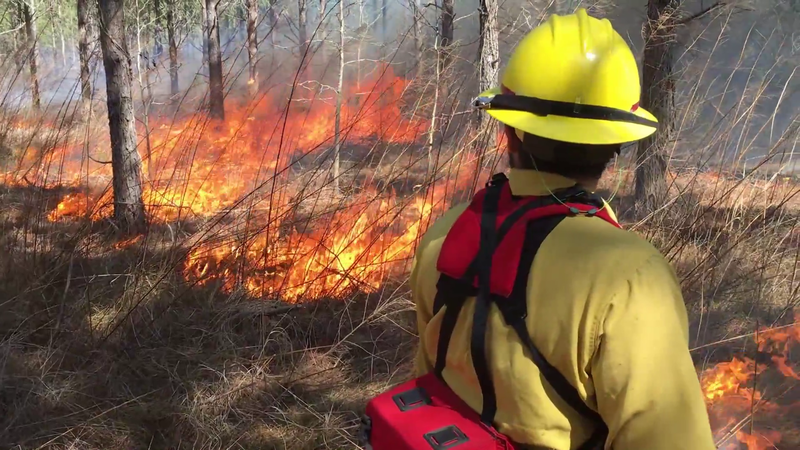 “Weather permitting, we have two more prescribed burns planned for later this week,” said Brandon Webb, county ranger for District 5 — which includes Wilson County — for the North Carolina Forest Service. Forest landowners use burning as a management tool. The No,. 1 benefit of a controlled burn is to reduce the risk of wildfire. Mike Mercer of Wilson, owner of a 68-acre tract of pine trees, said Friday’s burn was confined to 19 acres of the tract. The property was farmland until 2000 and trees were planted in 2002. Burning the acreage will eliminate many of the sweet gum, poplar, red maple and cedar trees that have grown in between the pines. Burning off pine straw, fallen leaves and small brush will permit native grasses and other desired plants for wildlife to grow. According to Mercer, the controlled burn will release nutrients into the soil and stimulate growth. “A lot of people say that burning this is some of the best fertilizer because you put so many nutrients back into the earth,” Mercer said. The end result will be a favorable habitat for deer, turkey, quail, rabbits, dove and other animals. “They are very pretty to look at,” Mercer said. Ideally, the controlled burn will reduce by up to about 70 percent the brush that is keeping needed light from reaching the ground for new growth. Each year there is only a small window when conditions are favorable for controlled burns, and that window is closing. “Usually that’s when we have higher winds and lower humidities, which are two ingredients to a wildfire. Getting into late March, our fire season starts, so we don’t do as much controlled burning because we are on standby waiting for wildfires,” Webb said.